The maker of a much-beloved children's toy has branched out into a new market and now offers versatile furniture-making kits to delight kids of all ages. What happens when you combine the ease and convenience of flat-pack, ready-to-assemble furniture with the fun and whimsy of the Legos you loved as a child? Well, now we know. 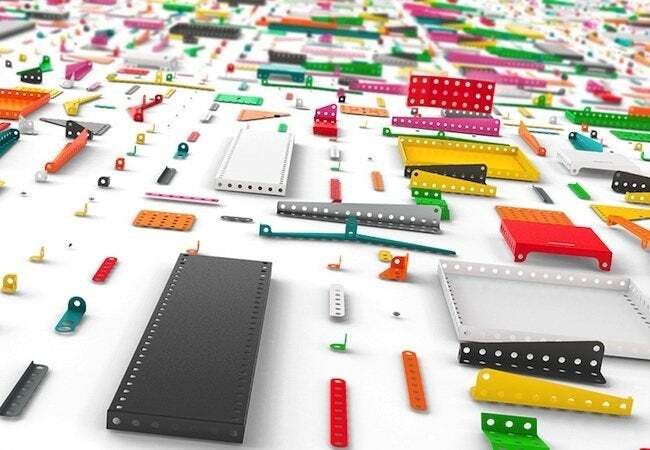 For decades, the French company Meccano has been manufacturing Erector sets—toys that kids prize for their endlessly interchangeable nuts, bolts, and plates. This year, for the fist time ever, Meccano enters the adult market with life-size pieces designed to make genuine furniture for everyday life. 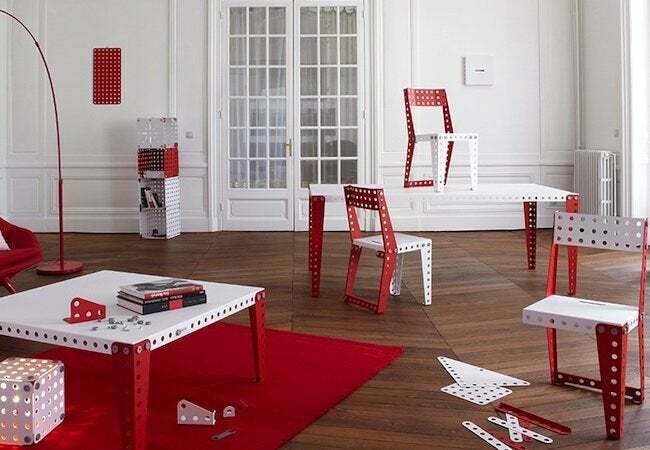 In the Meccano Home collection, there are 20 modules that allow for the construction of everything from tables and chairs to bureaus and buffets. Just as an Erector set lends itself to a virtually limitless number of configurations, so too can Meccano Home components be used for whatever you want to build—be it a piece of furniture that would be immediately recognizable out of context, or a custom creation that only makes sense given the idiosyncrasies of your space. Do you want a coffee table with an integrated chair? How about a modular storage system that doubles as a work surface? “With Meccano Home, the user becomes the creator of his living space,” states the company’s Web site. You can follow the included instructions, of course, or you can completely ignore them. So it’s just like when you were a kid, except with one major difference: At the end of the day, you no longer have to put your toys back where they came from! Featuring a tough, durable finish, the Meccano Home pieces, available in eight vibrant colors, are only part of the story. Additional elements can be purchased to add even more functionality where necessary or desired. For instance, with a crank and fixing kit, you can create a table that doubles in size or contracts by half , depending on the number of people you wish to accommodate. Similarly, the addition of a light kit turns an ordinary storage unit into an extraordinary lamp. While it’s hard to envision a home decked out exclusively in Erector set-style furniture, it’s easy to see the appeal of Meccano Home for DIY kids of all ages! For more information, visit Meccano Home.